If your school already has an Admin, ask them to set you up. Otherwise . 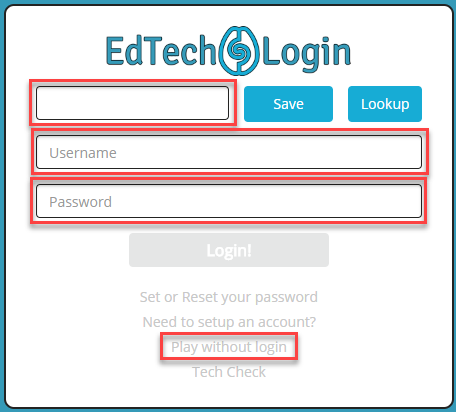 . .
Go to edtechgames.com/login and choose "Setup Account"
Choose School Admin if you will be managing or viewing multiple teachers and/or classes. Otherwise choose Classroom Teacher. Be sure to enter your school email so we can verify your connection to the school. Follow any instructions the form gives you. Click the Confirmation link that the form will email you. Go back to edtechgames.com/login and login to your site. Go to edtechgames.com/login and login to the Portal with your email and password. Go to Educators --> Import. 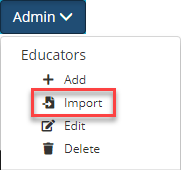 While you're importing teachers, you will generally want to select an "Import Style" that will ALSO create a class for each teacher and assign them to it. If you you're not already logged in, go to edtechgames.com/login and login to the Portal with your email and password. Make sure you already have classes created and teachers assigned to them. See above. 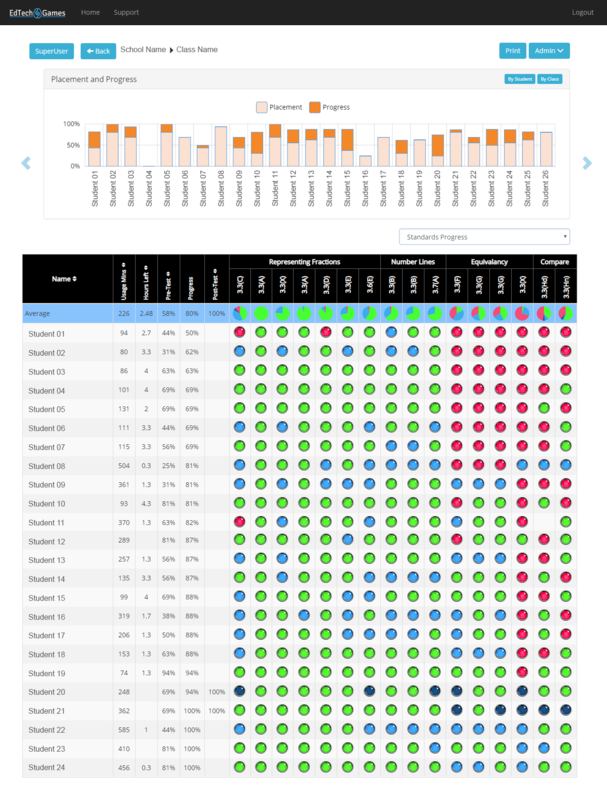 Paste your student data so that it matches the necessary data structure. 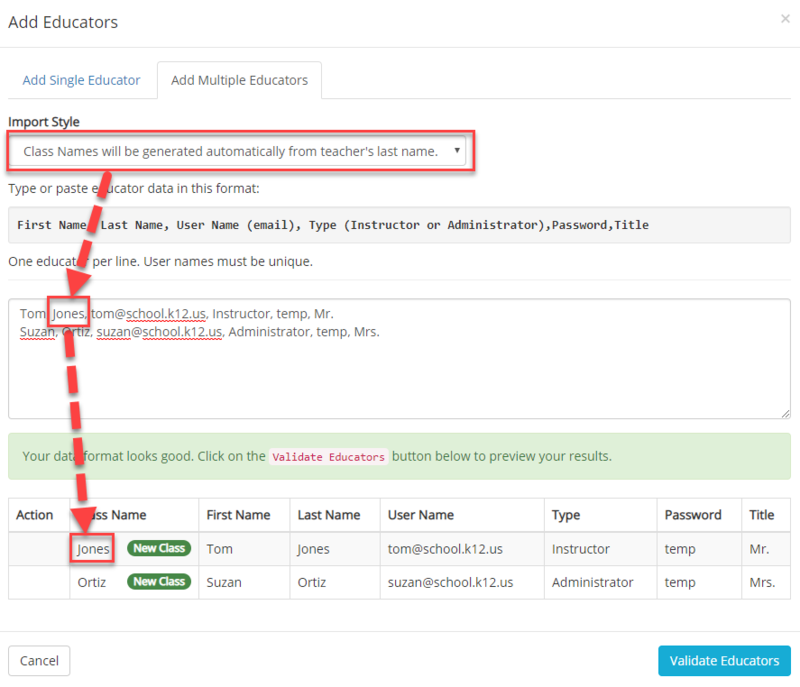 Note that the Class Name listed MUST match a class that already exists in your school. Usernames MUST be unique ACROSS THE ENTIRE DISTRICT. Be simple with username and passwords so they're not too burdensome for students. 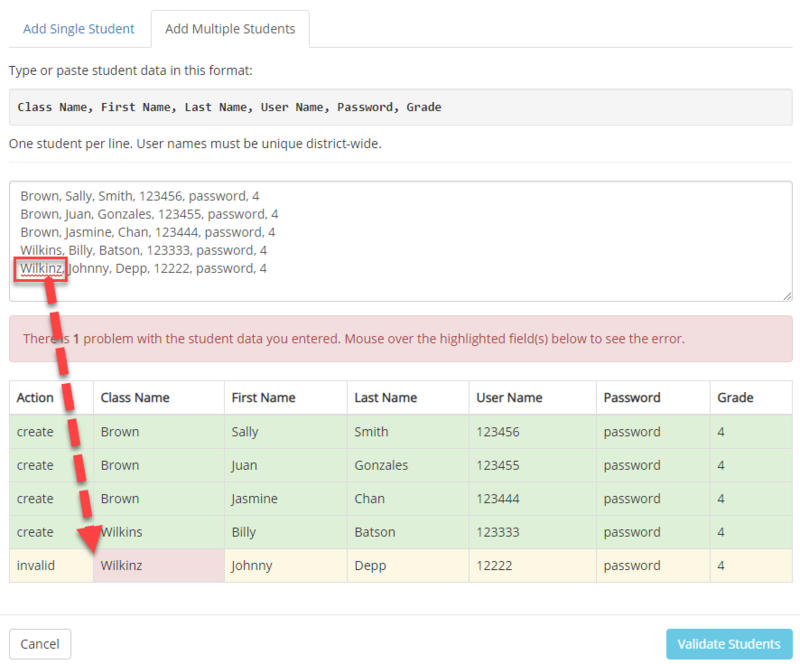 Many schools simply repeat the username or have 1 common password for the school. When your data is pasted in, click "Validate". Correct any errors it finds. When there are no errors, CAREFULLY review the additions and changes to make sure it's doing what it should. Then press "Import Students." This program will do amazing things for your students, but if you MUST find a way to get it consistently into the schedule. THEN you must append your district's 7-digit NCES number. Go to edtechgames.com --> Login. (unless it is already pre-filled. 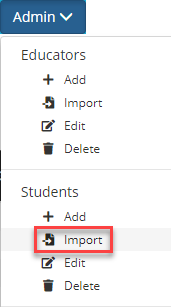 See "Run your students through" in Setup). If you don't know it, work with your teacher or school Admin. To just demo, choose "Play without logging in." When the game launches, press "Go" and follow the instructions. Keep in mind that this game have been designed and HEAVILY tested to be intuitive for students. To get the best sense of how it operates, please grab a student and watch how they approach it. 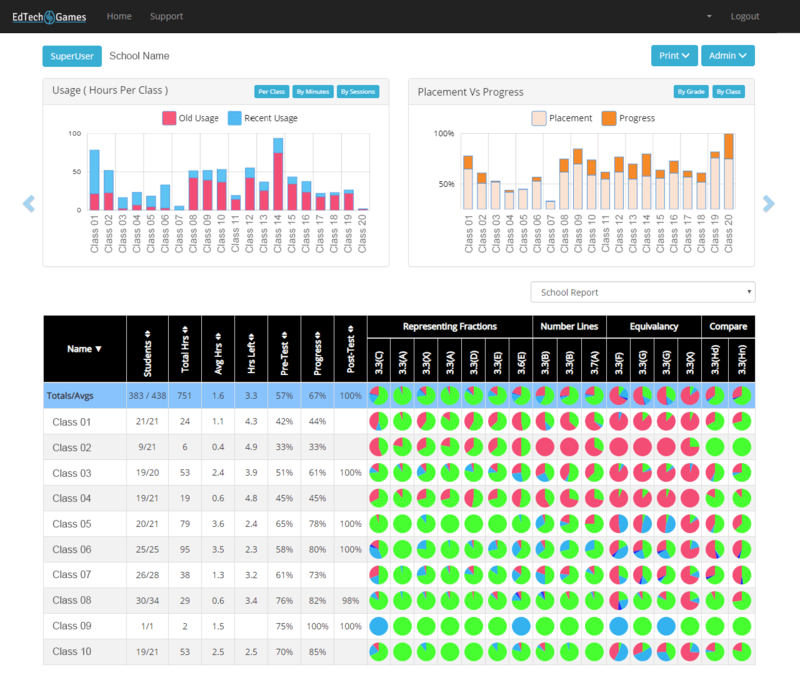 Your class report will includes a Progress Summary, Usage Hours, Hours Remaining forecast and a fairly detailed snapshot of where each student is. Our first, small study from 2018 administered a paper pre-test to a 3rd-grade class near the end of the year, covering the first half of 3rd-grade fractions standards. Half of the students were then randomly selected to play our Fractions game, while the other half worked on fact fluency. Students played the game for roughly 2 hours, spread across 4 sessions and then a written post-test was administered to all students. 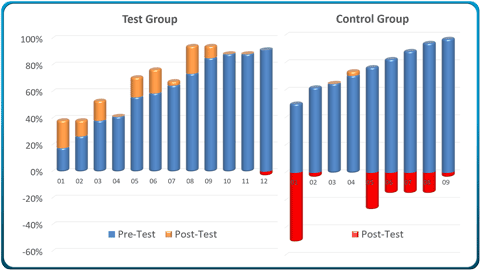 The average post-test score of the Fractions group was 12% higher than the average post-test score of the Control group. If you remove the students who began higher than 85% and therefore had little room to improve, the Fractions group improved 16% more than the Control group. Small note: The post-test was administered on the last day of class so students were a bit distracted, which is why you will notice a general downward trend to performance. In a more balanced setting, both groups would likely have scored a bit better. Which Common Core or TEKS Standards do you cover? We currently cover the Common Core and TEKS fraction standards for 3rd grade and we will be filling in the remaining fractions standards for 4th and 5th quickly. We don't know yet exactly when. For now we have been rather stunned by our initial research results. Nearly all of the students we have assessed so far have shown a tremendous need to review these foundational fractions concepts. As	a	result,	we	are	very eager to help students truly master these foundational concepts so that they will be prepared as soon as our additional curiculum becomes available? How long does it take students to complete the program? Naturally, that will depend on how much they currently have to learn. In our research so far students seem to follow a rough bell curve from 1 to 20 hours. So the fastest finishers can (and should) test out in their first session or two, while the deeply struggling students can possibly require 20 hours. How much usage do you recommend? We recommend two 30-minute sessions per week so that struggling students will have sufficient time to master fractions? When in the year do you recommend we start using the program? We recommend starting 4th grades and higher immediately. Our research shows that they are all usually lacking significant fluency and confidence with our most basic fractions concepts. Starting them early will give even your struggling students to master these pre-requisite skills before you start trying to teach them new concepts. We're not currently aware of any bugs in the game. If you find one please use the in-game bug reporter to send us as much information about it as you can. Thank you!